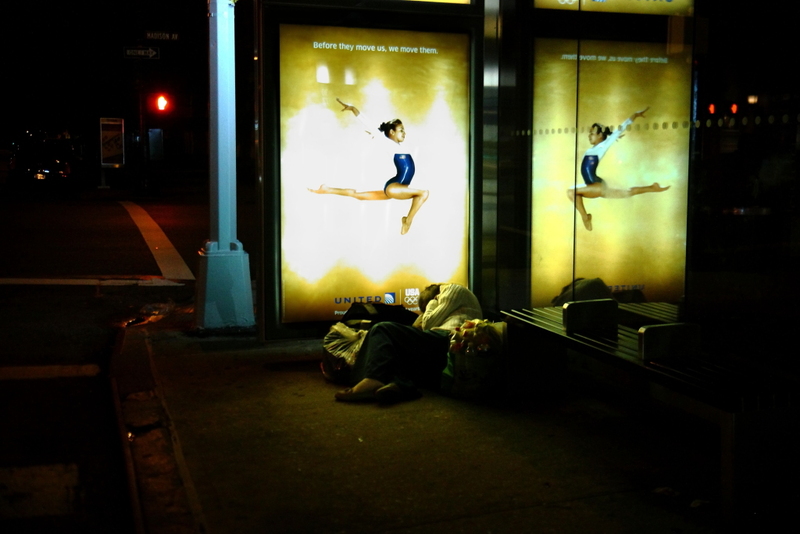 Just off Madison Avenue on the Upper East Side of Manhattan, a homeless woman sleeps in a bus shelter surrounded by her meager belongings. Above her, an almost nymph like image of an athlete. Strong, graceful and confident. The poster child of a proud Olympic sponsor. Well ……….. I can see the irony. Another thought-provoking pic; I wonder how many of us would have ‘seen it’. By the way, thanks for the ‘like’ on my post of 23 June; this is where my ‘crush’ on the haiku – in this case someone else’s creation – and the idea of putting it with a picture began. Maybe interesting to you as a photographer: I think that the picture might have been taken on the box Brownie – my first camera – which I received for passing my 11+ exam. But photography for me began earlier – developing prints by gas light – on ‘gas light paper’ – with my grandmother. Fascinating stuff, thanks for that. I know this place, this woman. There are so many like her in NY now, that sad number is growing. It is a touching photo, and I believe you are the only one who could have captured it. You are very kind, thank you. Such a soft light…on such a dark subject….beautifully captured. Great image. I like all of the contrasts you have managed to capture in the one image. Thanks, I thought it was rather topical. Great image and great juxtaposition. I think we see these little “ironies” on a daily basis, but often they just pass us by unnoticed through familiarity and other times I think we pretend not to see. Like most things, the more acceptable it becomes the less it dismays. Irony that screams…or cries…. Well done. I happen to be a big fan of New York sarcasm. Thanks for the comment.